The first ever robotic explorer to study the “inner space” of Mars launched on Saturday, May 5, blasting off into outer space onboard an Atlas 5 rocket. The Mars InSight probe took off from Vandenberg air force base in California, making it the first U.S. interplanetary spacecraft to be launched over the Pacific. The payload was released about 90 minutes after the 4:05 a.m. PDT launch time, and will now travel 301 million miles (484 million km) to Mars. The lander is expected to touch down on the Red Planet in about six months, at a location near the planet’s equator called the Elysium Planitia. 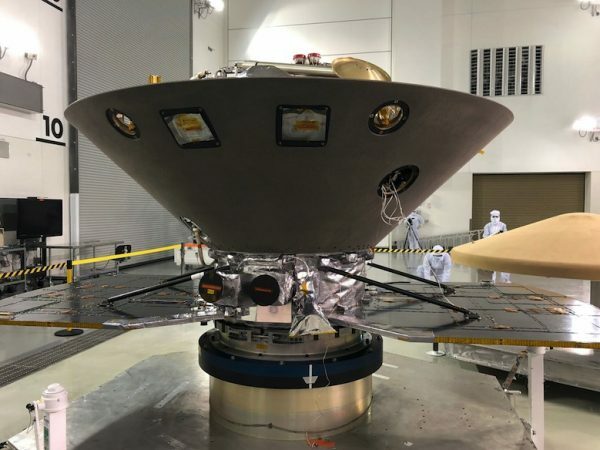 InSight, short for Interior Exploration using Seismic Investigations, Geodesy and Heat Transport, is a Mars lander designed to perform an in-depth study of the Red Planet’s crust, mantle, and core. The mission is to “give the Red Planet its first thorough checkup since it formed 4.5 billion years ago,” NASA stated. Scientists hope that by studying the interior structure of the Red Planet they can answer key questions about the early formation of rocky planets, like Mercury, Venus, Earth, and Mars. “How we get from a ball of featureless rock into a planet that may or may not support life is a key question in planetary science,” said Bruce Banerdt, InSight principal investigator at Nasa’s Jet Propulsion Laboratory in Pasadena, California, according to the Guardian. 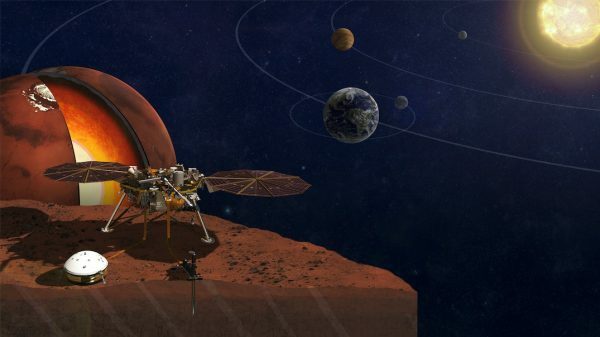 The lander will “delve deep beneath the surface and seek the fingerprints of the processes that formed the terrestrial planets,” NASA states. It will do so by measuring the planet’s “pulse” (seismology), “temperature” (heat flow), and “reflexes” (precision tracking). Once settled, the solar-powered InSight will spend two years—about one Martian year—plumbing the depths of the Red Planet.